In today’s complex, changing world, ENVISION offers you the confidence to enjoy life to the fullest, today and tomorrow. Whether you are starting out, in mid-journey, or arriving at long-sought destinations, the process of charting your way toward your financial goals may be about to take a significant turn. We are pleased to introduce ENVISION. And we believe you will soon wonder how you and your Financial Advisor made decisions without it. Monitoring progress toward your goals, adapting to changing conditions to help manage investment risk — ENVISION is designed to help you do all that. 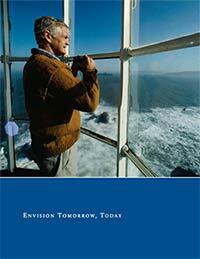 Welcome to ENVISION and the future of investment advice. The ENVISION process begins with a simple discussion in which you and your Financial Advisor identify and prioritize the spectrum of your life goals that are tied to your investment portfolio. Potential trade-offs and timetable adjustments are assessed at the outset. An understanding of the risk you are willing to accept in your investment portfolio is also established. Then, using an advanced simulation methodology, ENVISION analyzes the delicate balance needed for you to move confidently toward your goals without undue compromise to your lifestyle or unnecessary investment risk. ENVISION tests that balance in the context of 1,000 possible economic environments. The ENVISION process can be repeated and updated as often as you wish to reflect new realities in your investments — and your life. ENVISION is designed to bring new simplicity to pursuing your financial goals and new clarity to your overall investment decisions. The science of statistical modeling was created to help people make better decisions in the face of uncertainty. With ENVISION, this sophisticated methodology is now available to our clients. The ENVISION process starts with your financial situation today and simulates 1,000 hypothetical market and economic scenarios, allowing you to see the impact that different market environments would have on your goals. It is a way of estimating the possible future course of your investments and discerning changes that might be needed to strike an optimal balance between today and tomorrow. © Copyright 2018 Rhodes Securities, Inc., Member FINRA/SIPC.